If you are planning on flying into California for a visit to Yosemite National Park, there are several large airports to choose from that require less than 6 hours of driving (in deal traffic conditions) to get to Yosemite Valley. Choosing a city/airport involves a balance between availability of convenient flights, cost of flights, driving time (and amount of driving stress), and connecting the other destinations in your vacation itinerary. Below are several cities and airports that could make good starting points for a trip to Yosemite. San Francisco International Airport (SFO). 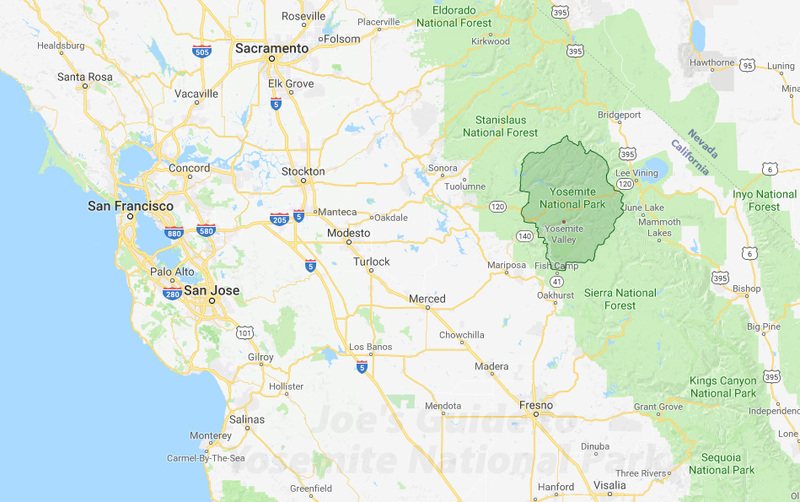 While this may be the longest drive to Yosemite out of all airports on this list (roughly 4-6 hours in ideal traffic conditions), you are likely to get a cheaper direct flight to this bustling city and tourist destination. And if you want to include a few days sightseeing in San Francisco as well, perfect! Oakland International Airport (OAK). Oakland is located on the east side of San Francisco Bay and is a slightly shorter drive to Yosemite. Fresno Yosemite International Airport (FAT). Fresno is probably the most convenient city to fly into if you want a straight shot into Yosemite from the south. Located only 45 miles south of Oakhurst, it's roughly a 2.5-hour drive to Yosemite Valley (in ideal traffic conditions). The downside is that not all airlines provide affordable flights without too many layovers to this smaller airport. Big Oak Flat Road (Route 120) enters Yosemite from the northwest and is a likely route for those coming from Sacramento or San Francisco, passing through the historic pioneer town of Groveland along the way. 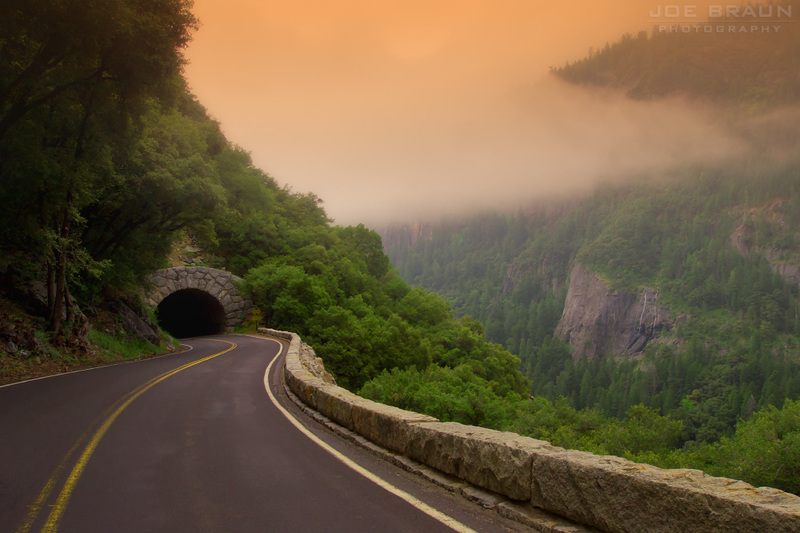 Just outside of the park boundary, Evergreen Road heads north to the remote Hetch-Hetchy section of the park. El Portal Road (Route 140) enters from the west, passing through Mariposa and the tourist-friendly town of El Portal along the way. Wawona Road (Route 41) enters Yosemite from the south and is a likely route for those coming from southern California or flying into Fresno, passing through the fast-food friendly town of Oakhurst along the way. The famous Mariposa Grove of Giant Sequoias is located just north of the park entrance booths. Tioga Road/Tioga Pass Road (Route 120) is the long and winding high-country road (roughly 64 miles within the park) that enters Yosemite from the remote northeast near the town of Lee Vining and Mono Lake and joins up with Big Oak Flat Road. While this is a likely route for those driving in from Nevada, note that this high-altitude road is closed in winter. Tioga Road typically opens in May/June and closes in mid-November, but dates change every year due to the amount of snowfall. Glacier Point Road: This 16-mile long spur road off of Wawona Road takes tourists to the popular and panoramic Glacier Point. Like Tioga Road, this road also closes due to winter snow, but the road is plowed up to Badger Pass for those looking to visit the Yosemite Ski & Snowboard Area. 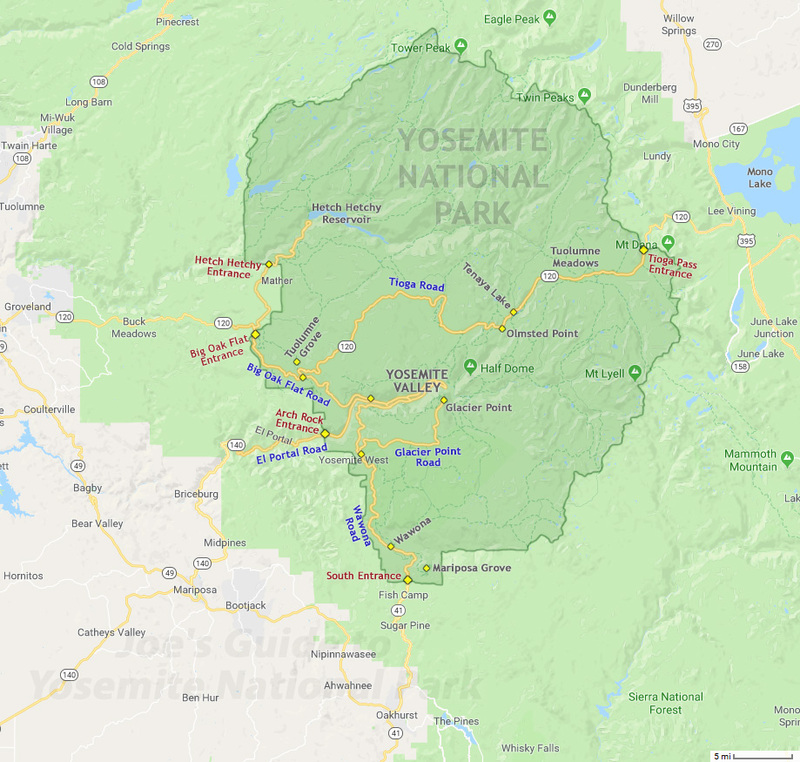 Before any trip to Yosemite, it is a good idea to study road maps and pick up a copy of the National Geographic Yosemite National Park Map to get oriented.